Christology is the field of study within Christian theology that is concerned with the nature and person of Jesus as recorded in the Gospels and Epistles of the New Testament. 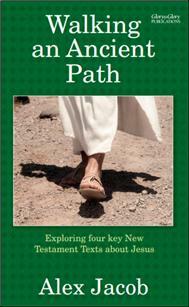 As such it is an 'ancient path' that has been travelled by Jesus' disciples since the very beginning, as Christians have grappled with this wonderful theme. This short book is an excellent introductory resource for those wanting to explore the relationship of the Lord Jesus' nature and person with that of God the Father. Christology in the fullest sense is concerned with the details of Jesus' ministry, His acts and teachings, with the prime objective of arriving at a clearer understanding of Who He is in His Person, and His role in Salvation. Exploring Christology is a natural step in the maturing of any Christian believer. Alex Jacob takes his readers through four key New Testament passages that underscore and underpin the principal beliefs of the Church about her Lord. Alex Jacob is a United Reformed Church Minister. He is currently serving as a Director of The Church's Ministry Among Jewish People (CMJ) – a 200 year old ministry. Alex has a well respected teaching ministry and brings many important insights into his writing based upon years of research and ministry both in the UK and Israel. Walking an Ancient Path is Alex's fourth CMJ book. Recent major publications include: The Case for Enlargement Theology (2010), Receive the Truth (2011) and Prepare the Way (2014). All have been highly acclaimed and well reviewed in many Church and theological settings. Bible students doing introductory studies in the area of Christology. Preachers and Bible study leaders who want a useful starting point for study and reflection. Useful for both personal and group study.